Kryt’s call centres are based in Lagos with over flow facilities in Ireland, from which we provide solutions to helps organizations manage their customer relationships and handle all customer enquiries for our client’s customers including contact by telephone, white-mail, e-mail, web-mail, SMS and fax. Save them millions in upfront requirement, selection, training and wages expenses. 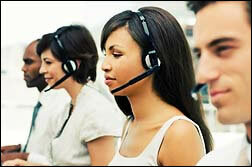 Guarantee high performance and high quality Customer Care and Customer Contact services. Ensure that clients pay only for productive talk minute and do not pay for breaks, sickness or vacation time. Eliminate the need for extra staff management, office rental and spaces so that there are no missed sales or customers and no over staffed idle time. With a flexible infrastructure and technology, experienced management team and unrivalled efficiency, you are guaranteed of effective customer relationships management. Want to know how we can help you eliminate the overheads of managing your customers and other back office functions?